ESTERO, Fla., May 16, 2017 /PRNewswire/ -- Hertz Global Holdings (NYSE: HTZ) – announced today that the Hertz Gold Plus Rewards loyalty program received top honors in the 2017 FlyerTalk Awards. Hertz Gold Plus Rewards was voted the Best Rewards Program in the Drive category across every geographic region in the world – the Americas, Europe/Africa and Middle East/Asia/Oceana – for the sixth consecutive year. Hertz also earned a FlyerTalk Award for Outstanding Benefit in the Drive category for its Five Star and President's Circle Gold Plus Rewards elite membership tiers in Europe/Africa and Middle East/Asia/Oceana. 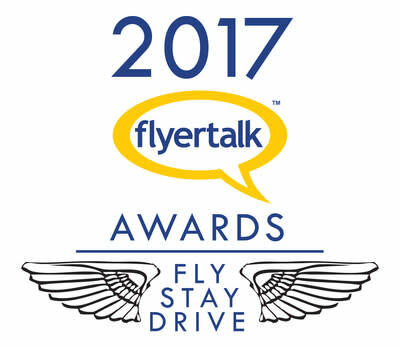 "We are honored that Hertz Gold Plus Rewards earned top recognition in the FlyerTalk Awards," said Hertz President and CEO Kathryn Marinello. "The FlyerTalk community represents many of our loyal customers and we thank them for choosing Gold Plus Rewards as their favorite car rental rewards program every year since the Awards debuted in 2012." The FlyerTalk Awards are held annually and determined by members of FlyerTalk, an online community comprised of more than 675,000 frequent travelers. FlyerTalk members are dedicated to finding and sharing expert knowledge of airline, hotel and car rental affinity programs, voting once a year for the best ones within the Fly, Stay and Drive categories. Faster Rentals: Members can skip the counter at more than 50 airports around the world. At more than 4,000 locations worldwide, members can simply show their driver's license, pick up their keys and go. Elite Status: Members can achieve status in Hertz Five Star and Hertz President's Circle elite membership tiers quickly to receive even more bonus opportunities and benefits. Mobile Gold Alerts – Carfirmations: Members receive a personalized email or text message sent to their phone with up-to-the-minute information regarding the rental before they arrive. Choose Your Car: At participating locations, members can select the vehicle they want to drive. Hertz is committed to continuously improving the Gold Plus Rewards experience through service enhancements such as Ultimate Choice. With Ultimate Choice, customers can choose the car that's right for them by selecting any vehicle within their assigned zone based on their loyalty status and the car class they reserved. Gold Plus Rewards members have access to exclusive Ultimate Choice lots that feature a wider selection of vehicles when they make a reservation for a midsize car or above. Ultimate Choice is currently available in more than 20 top U.S. airport Hertz locations with more planned to launch the service by the end of the year. For more information, visit www.hertz.com or follow Hertz on Facebook and Twitter. The Hertz Corporation, a subsidiary of Hertz Global Holdings, Inc., operates the Hertz, Dollar and Thrifty vehicle rental brands in approximately 9,700 corporate and franchisee locations throughout North America, Europe, The Caribbean, Latin America, Africa, the Middle East, Asia, Australia, and New Zealand. The Hertz Corporation is one of the largest worldwide airport general use vehicle rental companies, and the Hertz brand is one of the most recognized in the world. Product and service initiatives such as Hertz Gold Plus Rewards, Carfirmations, Mobile Wi-Fi and unique vehicles offered through the Adrenaline, Dream, Green and Prestige Collections set Hertz apart from the competition. Additionally, The Hertz Corporation owns the vehicle leasing and fleet management leader Donlen Corporation, operates the Firefly vehicle rental brand and Hertz 24/7 car sharing rental business in international markets and sells vehicles through Hertz Car Sales. For more information about The Hertz Corporation, visit: www.hertz.com.